User experience professionals want to be part of the product, business and experience conversation early and often. How can we truly collaborate to solve more than just design problems and make an impact? Stop being Designers and start collaborating like comic book creators. Your host is a Sr Manager of Product Design at Disney with over 20 years experience in design and a life long comics fan. A designer who loves comic books, brush pens and doughnuts, Troy Parke is passionate about creating compelling, usable and high performing product experiences. He leads product design teams in unifying the user experience across touch-points, creating design systems and iterative rapid prototyping to deliver. 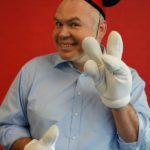 Troy currently serves as Senior Manager Product Design for Disney Parks and Resorts Digital experiences on premier vacation brands including: Walt Disney World Resort, Disneyland Resort, Disneyland Paris, Shanghai Disney Resort and Hong King Disneyland Resort. Troy previously served as Product Design Manager at Alaska Airlines, is a former UX Design Manager at Big Fish and his past project clients include Rolling Stone, Microsoft and Marvel. There you go.